In August 1992, Fusion made their first test to the world. As one of the first to start testing again from Scandinavian ground after a long beauty sleep of the Scandinavian Free Radio scene. 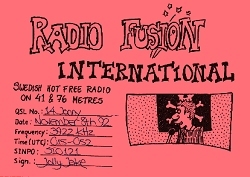 For the first years, Fusion used an old transmitter good for about 30 Watts, but later on in 1995, he got a new one, good for about 200 Watts. The DJ behind Fusion, Jolly Jake, likes effects and echoes to the sound, so therefore has it from time to time been quite hard to hear what was going on in the studio. As the old transmitter only had the capability to cover 76 and 41 mb, there were the places to search for the sometimes strong and sometimes weak signal.